Popular English poet Joseph Addison once said “Beauty commonly produces love, but cleanliness preserves it.” Being a country of billions, cleanliness is a major issue for India. The Government spends millions of rupees to keep the country clean. Mumbai city spends around 2300 crore rupees every year on waste/garbage disposal then why do we fail to keep our streets clean? In the past, our cities which includes Delhi (the capital) and Mumbai have been listed amongst the unhygienic cities in the world. The reason behind this filthy image of our country is not the government but “us”. Yes, we did it by not caring for our environment. With the dream of creating a clean and beautiful India, our honorable prime minister Narendra Modi introduced a national level campaign – “Swachh Bharat Abhiyan”. It was launched by Mr. Modi on 2 October at Rajghat, New Delhi during the Gandhi Jayanti ceremony. Modi quoted that we have shamed the father of our nation who advocated cleanliness. Swachh Bharat Abhiyan is greatly inspired by Mahatma Gandhi’s ideologies. On the 66th death anniversary of the Mahatma, PM urged the nation to join hands, support this cause and make Gandhiji’s dream of a “Clean India” come true. 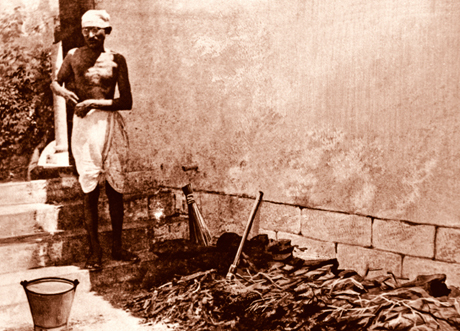 Mahatma Gandhi never hesitated to pick up the broom and clean his corridors. Modi did the same, he picked up the broom and initiated the Swachh Bharat on the street of Rajghat. This act instantly inspired many. I totally agree with Anand’s view. Apart from cleaning our streets this initiative is about inspiring and educating people about cleaning and sanitation. This “Abhiyan” will surely motivate our youths and kids to value their surroundings and their homes. Twitter was flooded with praises from people supporting Swachh Bharat Abhiyan. Inspite of all the support we still need to work harder. The objective of this campaign is not media attention or praise but a clean India. To achieve this objective we need to put in more effort, involve more people and pledge that we will maintain the cleanliness of our country. The government will try its best to promote the vision of ‘Clean India’. The objective of this campaign is to develop a completely clean India by the 150th anniversary of Mahatma Gandhiji which is on October 2, 2019. To fulfill this dream, the prime minister has joined hands with 3 million volunteers which includes government employees, students from colleges and schools. Mahatma Gandhi was a man of discipline and principles. Mr.Modi wants us to support this movement as a tribute to this great man. Our prime minister believes that if every Indian will decide never to litter or trash his/her surroundings, no street in India will ever be dirty. So lets come together and make this dream come true. Nice collection of swach bharat abhiyaan. Salutation for all of them ………….. Thanks Vashishtha for your appreciation. I agree with you these people are doing a great job and we should join them. Reblogged this on My Note My Life.